Designed for the military to be used by active duty soldiers - Only Available to US Addresses or Military APO, DPO. - now available to the general public for a limited time. Exclusively sold and only available on AinterolHerbs.com at this time. 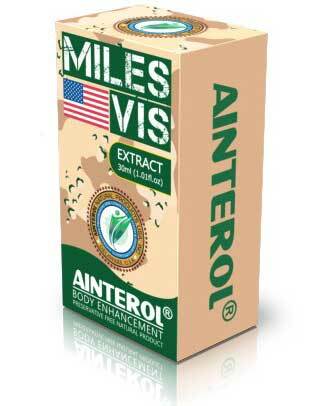 This specially designed all natural formula which was previously designed to be used by our US troops is now available to the public. It is recommended for Soldiers or Professional Athletes who need to perform at the highest levels possible. Decreases recover time after working out and aids in building muscle and stamina. Also Sensitises penile nerves and helps achieve easier and prolonged erections. The combination of herbal extracts work synergistically together for a powerful effect that no one herb alone can deliver. Contents: 30ml of extract containing Butea Superba, Eurycoma Longifolia, Tribulous Terrestris, Kaempferia Paviflora, Panax Ginseng all using 120:1 extracts, preservative free natural product. *Attention Military Personnel - We give a 10% discount to active duty Army, Navy, Air Force, Marines or any other Military branch personnel so please use our contact form to request your permanent discount coupon - proof of active military duty required to qualify. We also offer this discount to retired veterans.